William Leonard Roberts II (born January 28, 1976), known professionally as Rick Ross, is an American rapper, record producer, entrepreneur and record executive. ↑ Zisook, Brian (March 20, 2017). "Rick Ross on control of label artists". DJBooth.com. Retrieved August 4, 2018. ↑ "Jay-Z Gets Behind Rick Ross To Show He's 'Still In The Rap Business'". mtv.com. ↑ Harris, Chris (August 16, 2006). "Rick Ross Sails Past Breaking Benjamin, Takes Port Of Miami To #1". MTV News. Archived from the original on May 16, 2008. Retrieved May 24, 2008. ↑ "Port of Miami – Charts & Awards". Allmusic. 2006. ↑ Reid, Shaheem (March 19, 2008). "Rick Ross On #1 Trilla Beating Out Snoop, Fat Joe: 'I Told Them We Bossin' Up'". MTV News. Archived from the original on April 24, 2008. Retrieved May 24, 2008. 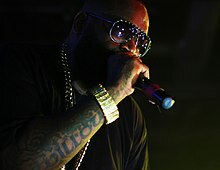 ↑ "Rick Ross: #1 Hottest MC in the Game". Rap Radar. February 19, 2012. Archived from the original on February 24, 2012. Retrieved March 30, 2012. This page was last changed on 26 January 2019, at 13:10.